Employees Of Two Companies Connected To the Gubernatorial Candidates Stepped Up For Their Campaigns, An Analysis Of Disclosures Show. The Michigan Secretary Of State Is Also Questioning One Of Schuette’s Largest Contributions. 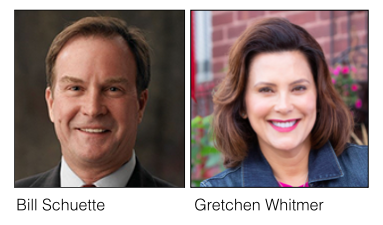 LANSING (DEC. 12, 2018) — Democrat Gretchen Whitmer and Republican Bill Schuette raised more than $23 million for their campaigns for governor. And disclosures show that employees of Michigan’s largest companies and some of the state’s largest interest groups helped foot the bill. Whitmer, the Democrat who previously served as Senate minority leader, and Schuette, the Republican who’s the current attorney general, had to turn in campaign finance disclosures covering through Election Day last week. The Michigan Campaign Finance Network has analyzed the candidates’ filings to determine how they raised all their cash. The following is a summary of what MCFN found. But first, it’s important to note that candidate fundraising represents only a portion of the money in a gubernatorial race. MCFN previously reported that outside groups that can raise and spend unlimited amounts spent more than double what the candidates spent in the general election campaign. w88 dashboardYou can read about some of the outside groups involved in the race at this link. Whitmer won the 2018 race for governor, and she did so with a significant fundraising advantage over her Republican opponent. She launched her campaign in January 2017. Through the general election in November 2018, she had raised more than $13.3 million in direct and in-kind contributions, according to campaign finance disclosures. She also received $929,395 in public funding for the primary campaign. Schuette launched his campaign in September 2017. He raised $10.0 million, not including $404,483 in public funding he received for the primary. Whitmer also had a much broader base of financial support. She reported about 77,000 individual contributions. Schuette’s campaign reported about 14,000 individual contributions. Whitmer’s top campaign donors were the Democratic State Central Committee ($100,000), the Michigan Infrastructure and Transportation Association PAC ($68,000), the Bernstein Family PAC ($68,000), the League of Conservation Voters PAC ($68,000), the AFSCME PAC ($68,000), the Michigan State Utility Workers PAC ($68,000), the Michigan Laborers Political League, ($68,000), the Operating Engineers Local 324 PAC ($68,000), the Michigan Regional Council of Carpenters PAC ($68,000), the United Auto Workers Michigan Voluntary PAC ($68,000), Blue Cross Blue Shield of Michigan PAC ($68,000) and the Democratic Governors Association Victory Fund ($68,000). 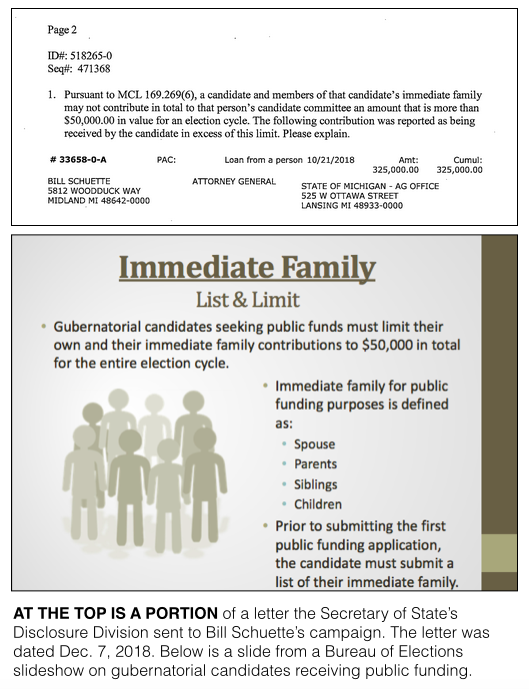 The most that a PAC can give a candidate for governor is $68,000 per election cycle. State political parties can give more than that limit. Schuette’s top donor was himself. He chipped in $325,000 for his own campaign on Oct. 21, 2018, according to his campaign finance disclosures. However, the Michigan Secretary of State's Disclosure Division has already questioned his ability to give his own campaign $325,000, according to a Dec. 7, 2018, letter. While candidates for governor can generally contribute unlimited amounts to their own campaigns, that’s not the case for gubernatorial candidates who accept public funding as Schuette did in the primary election. A candidate who accepts public funding can give his or her own campaign only $50,000 for an election cycle, according to official documents available through the Secretary of State’s website. The Secretary of State’s Disclosure Division has asked Schuette’s campaign to explain the $325,000 contribution. Troy Cumings, an attorney for Schuette’s campaign, said the campaign’s understanding of the law is the public funding requirements are separated into the primary election period and the general election period. Schuette’s campaign took public funding in the primary but didn’t in the general. Schuette made the contribution to his own campaign in the general election period. “If you don’t accept public funding in one election, you’re not subject to the public funding provision,” Cumings explained. Cumings added that the attorney general’s campaign believes the law is “pretty clear,” but he also said the question may not have come up before in a previous election. The Secretary of State's Disclosure Division has asked for a response from Schuette's campaign by Dec. 20. After receiving the response, state officials will have to decide how to proceed. After Schuette’s personal contribution, his top contributors were the Michigan Republican Party ($130,000), the Michigan Beer & Wine Wholesalers PAC ($68,000), the Realtors PAC ($68,000), the Michigan Chamber of Commerce PAC ($68,000), the Michigan Farm Bureau PAC ($68,000), the Miller Canfield PAC ($59,500) and the Auto Dealers of Michigan PAC ($56,5000). MCFN examined all of the contributions to the two gubernatorial nominees above $200 to determine which businesses’ employees gave the most. The results may not be that surprising. Dow Chemical Co. employees gave the most to Schuette. His stepfather was chairman of Dow. For Whitmer, employees of Blue Cross Blue Shield gave the most. Her father was previously president of Blue Cross Blue Shield. Dow Chemical Co. employees contributed $78,800 to Schuette’s campaign. Employees of LA Insurance gave $61,200. Employees of DTE Energy gave $46,700. Employees of the State of Michigan — not including Schuette himself — gave $44,200. And employees of PVS Chemicals gave $38,500. Blue Cross Blue Shield employees contributed $143,450 to Whitmer’s campaign. Employees of the law firm Dickinson Wright gave $71,050. Employees of the University of Michigan gave $71,000. Employees of Michigan State University gave $67,900. And employees of the State of Michigan gave $57,430. Whitmer also received more money from PACs and from out-of-state donors than Schuette did. According to MCFN’s analysis of donors who gave more than $200, Whitmer received $3.1 million from PACs and $1.8 million from out-of-state donors. Schuette received $1.5 million from PACs and about $640,000 from out-of-state donors.